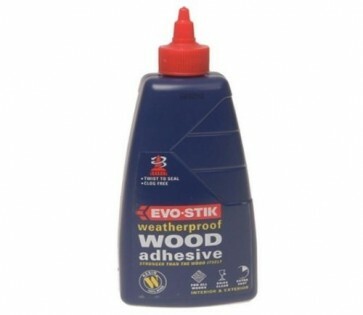 Brand New Evostik Wood Adhesive 500ml Evostik fast setting, extra strong weatherproof wood adhesive for interior or exterior use. Complies with EN 204 Type D3 - weatherproof, water resistant wood adhesive. Dries to a clear finish that can be sanded, painted or stained. Suitable for all types of wood. No mess, clog-free nozzle and twist to seal cap. Anti-roll bottle. Bonds: wood, hardboard, chipboard, blockboard, cardboard, paper, textiles.